Synonyms include fin-seal wrapping, crimp-seal wrapping, horizontal bagging and pillow-pouch wrapping. Flow wrapping is a horizontal-motion process in which product of any shape is wrapped in clear or printed polypropylene film. The end result is a flexible package with a non-lap type seal on the bottom and crimped end seals. 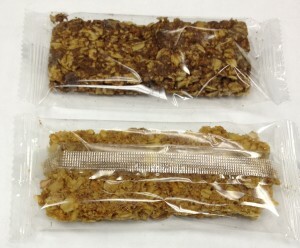 Good flow-wrappers get the film tightly around the product to minimize product shift within the package and minimize the “tails” on the product as they make case-packing more difficult. Both the process and films in flow wrapping are quite different from overwrapping. Flow wrap BOPP films, for example, need only to seal to themselves. Overwrap films need to seal to themselves and the other side of the film. There are zillions of products that are flow-wrapped. Think wipes, tissues, vending machine candy bars, etc. To learn more about Package Machinery’s line of flow wrappers, look here.